WW1 Reenactments Equipment : Great War Tommy WW1 Food Rations Labels : Lea & Perrins Worcestershire sauce. WW1 Reproductions and WW1 Reenactors Equipment / Kit - Lea & Perrins Worcestershire sauce. 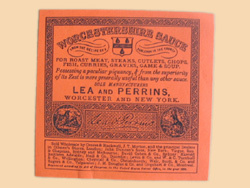 Period, familiar, orange label of Lea and Perrins (Worcester & New York) Worcestershire sauce. According to period avertising and advice to Tommy - "It makes Bully Beef appetising" and "When mixed with jam is an excellent substitute for chutnee"!